A Closer Look to Foodpanda. Oh and My 1st Ever Vouchers Giveaway! Foodpanda is an online food ordering service that operates globally in 27 emerging markets focused in Eastern Europe, Asia, Latin America and parts of Africa; including our dear nation Indonesia. At first I honestly thought that they’re a small local startup, but turns out that they’re huge already; backed by one of the largest online startup incubator worldwide called Rocket Internet, the same company that backed Zalora & Lazada, with its main headquarter in Berlin, Germany. Foodpanda’s main mission is to provide customers with an easy and secure way to order from the best takeaways in their area. In Indonesia itself, currently they have 70 restaurants on their list and soon to be growing vastly. 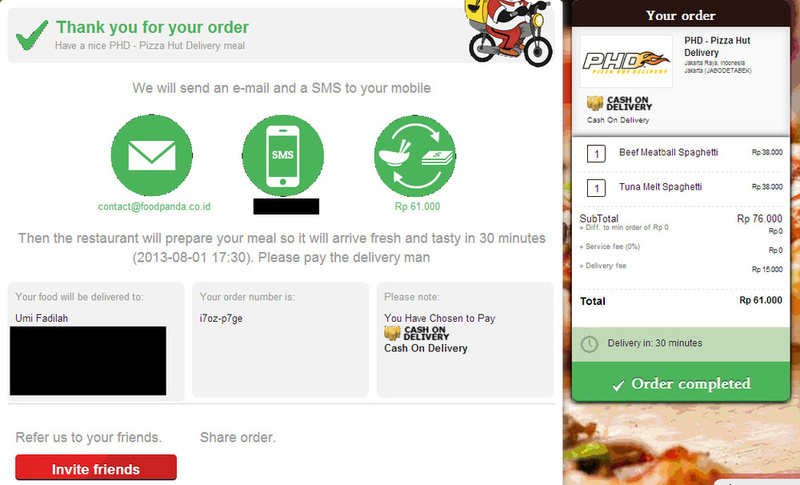 Starting from July 2013, http://foodpanda.co.id started a partnership with PHD – Pizza Hut Delivery's 81 outlets across Indonesia, a brand extension of Pizza Hut focusing on delivery. Pizza Hut is the world’s largest pizza chain with over 12,500 restaurants across 91 countries. Foodpanda already cooperates with over 500 businesses in Indonesia, and is now also able to offer PHD to its rising customer base. 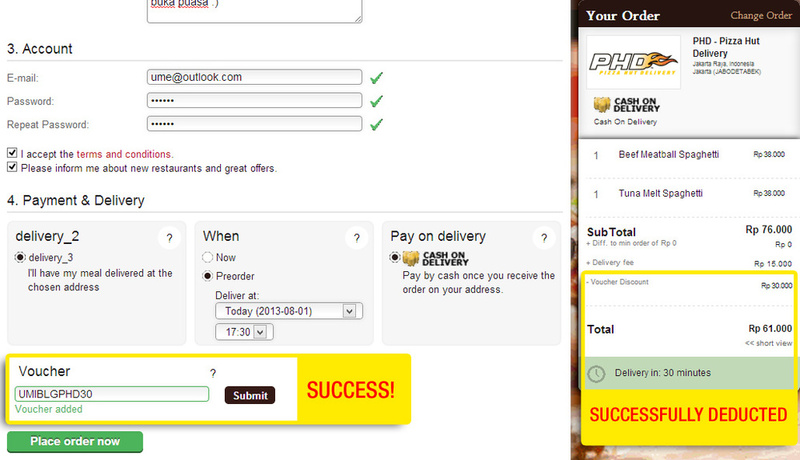 This easily means that PHD's meals can easily be ordered via Foodpanda’s online platform or its rewarded mobile app. AND NOW, MY VERY FIRST VOUCHER GIVEAWAY. SAVE RP 30.000,- FOR EVERY PURCHASE MINIMUM RP 75.000,- on every PHD item that is being ordered through www.foodpanda.co.id or via its mobile apps. Use Voucher Code: UMIBLGPHD30 at check-out. I personally just tried their service yesterday *to make sure whether the voucher code works or not, LOL* and I gotta say, it’s super easy & convenient. Basically you just have to enter which area you are currently in, and they’ll sort out all of the restaurants that accepts delivery within your area, then you just have to pick your orders & input your personal data, voila! Steaming hot foods are coming to your doorsteps. 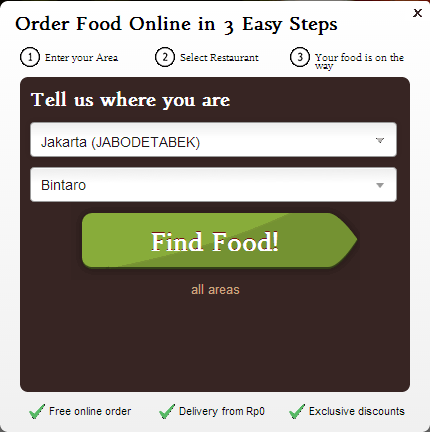 Go to http://www.foodpanda.co.id/ and click on the PHD banner right in front of the homepage. Usually you will see PHD right at the top of the list. 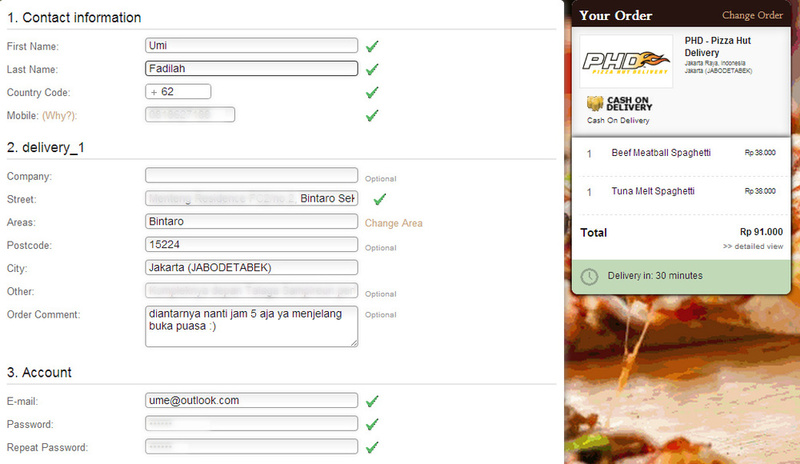 Please note that it charges Rp 15.000,- delivery fee. Click on Browse menu to continue to next page. Register for a new Foodpanda account. Use Voucher Code: UMIBLGPHD30 at the box provided. YEAY! Success! Oh and another thing that I found really helpful is that you can actually schedule your order a.k.a make preorders. Very convenient! You will receive a mobile verification code sent directly to your phone. Enter that to confirm your registration, and you're DONE! PS: In my case yesterday this didn't work, but surprisingly their Customer Service emailed me directly asking if there was any problem. Long story short, if any problem occurred, they'd be more than glad to help you... BLAZING FAST! I'm a happy customer. Done. :) Enjoy your PHD meal. Go go try it yourself!